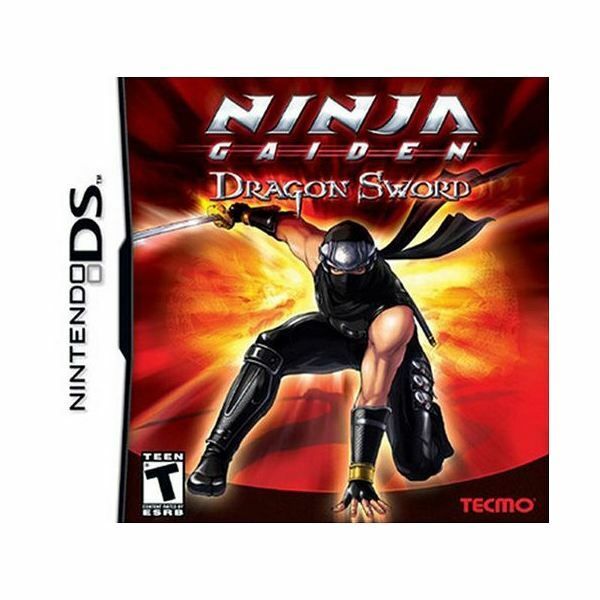 A sequel of sorts to the 2004 version of Ninja Gaiden for the Microsoft Xbox, Dragon Sword for the Nintendo DS follows in its predecessor’s footsteps by focusing on fast-paced sword-slashing ninja action. This 2008 release, developed by Team Ninja (the team behind the Xbox original) and published by Tecmo, picks up roughly six months following the events of its predecessor and once again stars super-ninja Ryu Hayabusa. So have Team Ninja and Tecmo and succeeded in duplicating the pace and intensity of the console Ninja Gaiden games, or is this another case of a handheld adaptation of a popular gaming franchise coming up short? Obviously, considering this takes place shortly after the events of the Xbox Ninja Gaiden, it would help if you’ve played that game and were at least somewhat familiar with its plot. Nonetheless, it isn’t integral to your understanding of and appreciation for Dragon Sword’s storyline. As the game opens, Ryu and his kunoichi (female ninja) ally Momiji are training. Afterwards, Ryu leaves, and a short time later, she departs for the village, only to be attacked by some mysterious enemies along the way. Upon reaching the village, she is attacked by a dragon and taken hostage. It is then up to Ryu to first repel the invaders from his village and then try to track down and free his abducted ally, all the while discovering more than a few secrets involving his clan’s lineage and the Dragon Sword weapon he wields. Solid writing, even if the plot is a tad bit confusing at times. This is the blueprint. This is how an action game for the DS should play. The controls are mostly stylus based. You use it to move your character around the screen, and draw horizontal, vertical or diagonal slashes through enemies to perform basic attacks. Sliding up allows you to jump, tapping an enemy causes you to throw a shiruken at them, and there are different special attacks and magical Ninpo spells that you can perform as well. Buttons to come into play for blocking (any button works, but I’ve found the R shoulder button works best) and to pause (Start button). Dragon Sword requires you to hold the DS unit sideways, ala Brain Age and Hotel Dusk. I thought this would be awkward for such an action-heavy game, but it really isn’t; just place the touch screen portion of the DS in your palm and rest the touch screen on your thumb, and it works ideally. Aside from the unique control scheme, the game is a fairly standard hack-and-slash affair, not that there’s anything wrong with that. Sure, it can get slightly repetitive at times, and even though you’re not mashing buttons in this title, it will still wear your hands out after lengthy play sessions. There are a lot of moves for Ryu to perform, including a wall jump, a horizontal diving aerial slash attack, fireball and lighting-based Ninpo moves, and so forth. Each enemy you defeat gives off essence, which based on the color can heal you, restore your Ki energy for Ninpo attacks, or give you currency to purchase upgrades at the shop. Ninja Gaiden: Dragon Sword is definitely an easier game than the Xbox entry in the series, at least on Normal difficulty. Sure, there are hordes of enemies to fight and some rather impressive boss battles, but there are plenty of save and healing points to be found. It is also on the short side (roughly 6-8 hours long). Length isn’t really much of an issue considering what a high quality effort this game is, however. The production values in this game are astonishingly high. The opening animated sequence has a very epic feel to it, complete with a fantastic intro song. The environments are simply gorgeous, with lush forests, flowing waterfalls, and tons of nice little touches that you can’t help but notice. The character portraits which appear during conversations and the animated story sequences are beautifully illustrated. The music is solid, the sound effects are quite well done, and in a nice touch, the game allows you to go into the options menu and optimize sound quality for either the built-in DS speaker or headphones. I also enjoyed the Japanese-language voice acting, though unfortunately there isn’t a whole heck of a lot of it. More would have been nice, but I suppose in the greater scheme of things that’s a rather minor gripe to have. If you’re a fan of the console Ninja Gaiden games, purchasing Dragon Sword is a no-brainer, but you don’t need to have a history with the series to appreciate just what a well-made and enjoyable DS title this is. The graphics are stunning and the production values on the whole are incredibly high. As impressed as I was by the visuals in the recently released Castlevania: Order of Ecclesia, I actually think this slightly older title might outdo it. The controls are outstanding as well. Seriously, I can’t imagine a hack-and-slash game being done any better than this on the Nintendo DS. They’ve nailed it right there. If you’re a fan of the genre, or the type of gamer who doesn’t mind battling through wave after wave of similar enemy types, this is definitely right up your alley. Because of the short length, you might want to rent first, but given that most retailers should have the game available for somewhere in the $15 to $20 range, purchasing it certainly isn’t out of the question.